Changing teaching methods and technology are introducing more flexible and responsive school models. 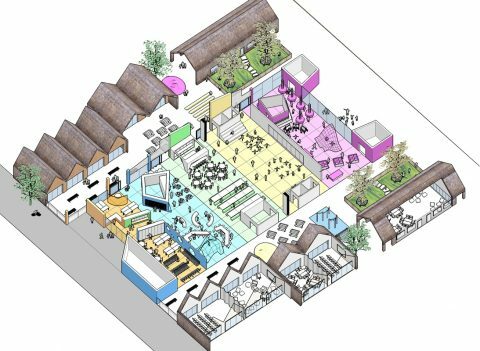 LOM has developed an alternative school design solution that supports the latest educational and learning developments, whilst being practical to run and maintain. Our Exploratory School model is inspired by Learning Town and Scale Free School concepts. The school embraces the use of local amenities such as sports centres, libraries and cinemas and is no longer limited by a fixed capacity, as the pupils are learning in multiple locations on and off-site. The core facilities are provided on site within a prefabricated kit-of-parts that can be applied to any given situation. Class bases are configured around an open and flexible exploration area for assemblies, group activities and individual study. Three key learning settings – home, exploration and play support a free-flow learning curriculum – where children learn key life skills through play and solving project based challenges.